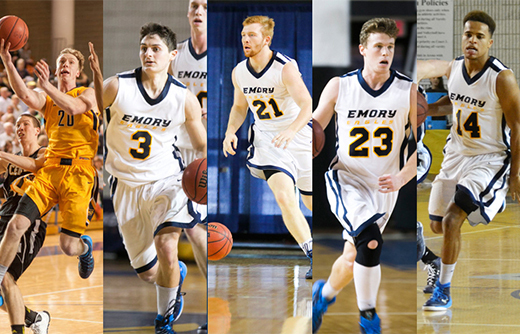 Five members of the Emory men's basketball squad have been selected to the All-University Athletic Association Team. The team competes in the first rounds of the NCAA Division III tournament this weekend here at Emory. Emory hosts the first and second round games for the NCAA Division III men's basketball tournament this weekend, March 6-7. The Eagles, 20-5 overall and ranked No. 11 by D3hoops.com, play their first game at 7:30 p.m. Friday in the Woodruff P.E. Center against Spalding University. The start of the NCAA tournament comes as five members of the Emory men's basketball squad have been selected to the All-University Athletic Association Team, and head coach Jason Zimmerman, along with assistants Chris McHugh, Pete Zaharis and Chad Hixon, were selected as the UAA Coaching Staff of the Year. It is the third time during Zimmerman's eight-years at Emory (2012-13 & 2009-10-co) that he and his staff have been chosen for that honor. The all-league player picks are chosen by the conference coaches. The Eagles saw two members of the program earn first-team status, one garner second-team acclaim and two land honorable-mention recognition. Senior Alex Foster highlighted the Eagles' UAA first-team honorees with his selection as the conference's Player of the Year award, the first Emory player to earn that distinction since Tim Garrett in 1990. Foster leads the UAA in overall scoring average with a 20.2 per-game mark, good for 32nd place in the Division III ranks. Emory's top scorer in 17 games during the campaign, Foster racked up a career-best 38 points in the team's season-opening win over Oglethorpe with that mark the third-highest individual game total in school history. Senior point guard Michael Florin brought home a first-team berth after being chosen as an honorable-mention pick the previous two seasons. Florin has directed the high-powered Emory offense, which is averaging a league-best 80.2 points per game, doling out 5.8 assists per game, good for the No. 2 spot on the league chart and 13th among all D-III performers. He holds down the No. 2 spot in the conference and is 18th nationally in assist/turnover ratio (2.77). Junior Will Trawick was Emory's lone representative on the second team. Trawick has started all 25 games and is second on the team and 13th in the UAA with an 11.3 points-per-game scoring mark. A double-figure scorer in 15 contests, Trawick has provided the Eagles with some scoring punch from long range with his 52 three-point field goals second on the team and tied for 15th on the Eagles' seasonal list. Senior Josh Schattie was named the UAA's Defensive Player of the Year while earning an honorable-mention berth on the all-league team. Schattie has been an unsung contributor to the team's success with his tenacious play on the glass and on the defensive end of the floor figuring significantly in numerous games. No. 2 on the team and 13th in the league in rebounding (5.2 rpg), Schattie has compiled 12 games of six or more boards, and his 2.0 per-game showing in offensive rebounds is 10th on the UAA ladder. Sophomore Jonathan Terry (landed honorable mention kudos on the All-UAA Team after seeing action as a reserve in all 25 contests and scoring at an 8.6 per-game clip, good for fifth place on the team and 26th in the league. Terry tossed in 10.2 points in conference affairs, with that average slotting him 22nd. Three members of the Emory University women's basketball team were selected to the All-University Athletic Association Team. 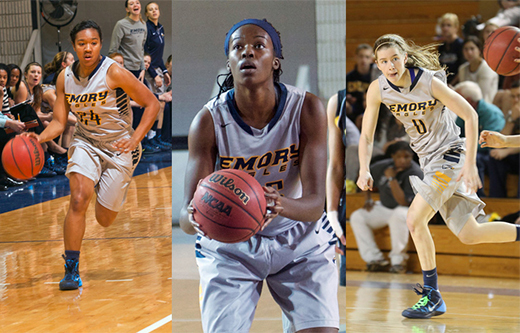 Three members of the 2014-15 Emory University women's basketball squad have been selected to the All-University Athletic Association Team. Junior Khadijah Sayyid (Longmont, CO) was tabbed as a first-team honoree, while also being selected as the league's Defensive Player of the Year. Sophomore Michelle Bevan (Houston, TX) and freshman Dumebi Egbuna (Clemmons, NC) were honorable-mention picks. One of two Eagles to have started all 25 games during the season, Sayyid led the team in both scoring (14.6 ppg) and rebounding (7.6 rpg), with those averages good for fourth and fifth place, respectively, among UAA players. She closed out the year as Emory's top rebounder in 15 games. Defensively, she led the squad and was second in the conference in steals in overall play (2.6 spg) and was first in conference tilts (2.9 spg). Egbuna enjoyed a solid rookie campaign, drawing 18 starting assignments over 24 games and ranking fourth on the team and third among UAA freshmen in scoring (7.9 ppg). She pulled down 4.9 boards per game, second on the team and 17th in the conference. Bevan was slowed by injuries at various stages of the year but did start 16 of 18 games, finishing third on the team in both scoring (8.5 ppg) and rebounding (4.7 rpg). She started all 11 UAA contests that she played in and averaged 7.8 points and 4.7 rebounds per outing. The Emory women's basketball team finished 2014-15 with an overall record of 12-13, 4-10 in the UAA.